Mo Farah became the first British athlete to win a global gold medal at 5,000 metres after delivering a devastating sprint finish to race away from his rivals at the World Championships in Daegu. The 27 year-old Londoner, who can now claim to be the greatest male endurance runner Britain has ever produced, was locked in a titanic struggle with Ethiopian Dejen Gebremeskel with 200 metres remaining before pulling clear as the pair entered the final straight. But, as Farah closed on the finish line, he then faced another challenge as American Bernard Lagat, the 2007 5,000m world champion, chased him with a late surge in the final 30 metres. Farah, his face racked with effort, held on to win in 13min 23.26sec, with Lagat taking the silver medal and Ethiopian Imane Merga, who passed Gebremeskel, taking the bronze. After crossing the line, Farah, who was â€œdisappointedâ€ not to have won the 10,000 metres crown the previous week, sank to his knees in prayer before he was taken over by tears. After embracing Alberto Salazar, the American coach who has overseen his astonishing transformation in the seven months they have been working together, he set off on a lap of honour with a Union Flag draped around his neck bearing the words â€œFly Moâ€. 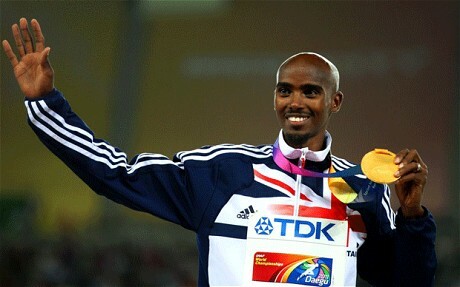 Farah became the first Briton to win two individual medals at a World Championship, ensuring his status as a superstar of Team GB in the run-up to next yearâ€™s Olympics in the city that has been his home since he moved from strife-torn Somalia as an eight year-old boy.